EcoFan is a smart sub floor ventilator used to remove damp, stale air in the sub floor that can cause structural damage, odours and mould growth. 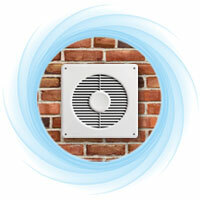 The EcoFan features an interchangeable exhaust or inward air flow capability. When two EcoFans are installed in the sub floor, the cross flow of air is achieved to allow effective ventilation and improve underfloor air quality problems. Poor quality air in an underfloor area can flow into living areas creating air quality and breathing problems for those living in the home, especially those suffering from asthma and allergies. Therefore, the Edmonds partnership with the Asthma and Respiratory Foundation NZ shows the support for EcoFan providing better quality air for those with breathing problems.